In sprinting circles, especially as it pertains to the B.C. girls high school track and field championships, it’s an absolute rarity. Winning the 100m and 200m races in the same meet has happened multiple times. So has winning the 200m and 400m races in the same meet. But winning all three? Having that kind of speed and endurance is so tough to find that its only happened twice over the first 50 years of the meet. 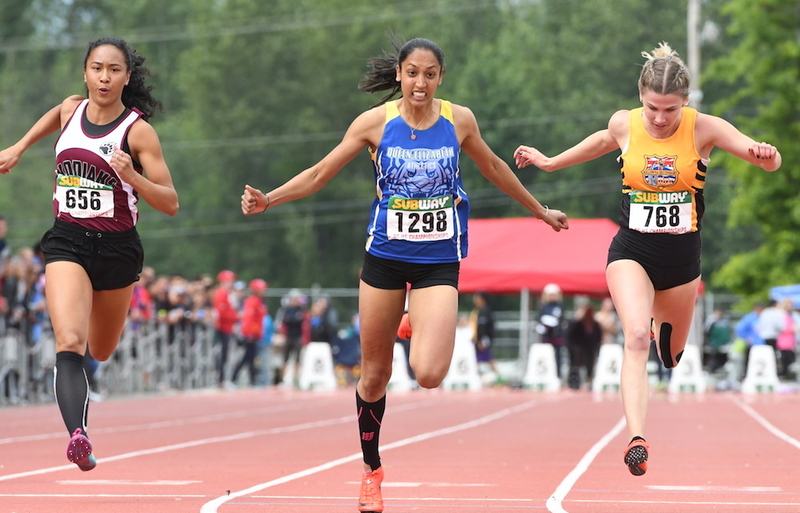 Come late Saturday afternoon at Langley’s McLeod Athletic Park, a talented Grade 11 from Surrey’s Queen Elizabeth Secondary School has a chance to start off the second half-century of the meet in grand fashion. That’s because over a span of about an hour on Friday, Jasneet Nijjar won the 100m sprint (12.17 seconds), and then the 400m (55.71 seconds). On Saturday, at sometime just after 4 p.m., the Royals standout will attempt to win the 200m final, completing a trifecta which has been accomplished just two other times since the meet began in 1967. In 1983, Kitsilano Blue Demons’ Diana Clark won the 100m (12.3), the 200m (25.2) and the 400m (56.80). Then in 2016, St. Thomas More’s Zion Corrales-Nelson managed the feat with gold in the 100m (11.85), 200m (25.0) and 400m (54.90). Nijjar clocked a personal best 23.83 at the distance at both the Canada Summer Games in July, and later at the Canadian junior nationals. “I did the same three here last year,” she explained of a memorable 10th grade debut at the senior varsity level. Last season at McLeod, Nijjar won the 200m (24.50) and the 400m (55.36), while placing third in the 100m (12.14). And if her potential trifecta should become reality Saturday, its timing, just two years after Corrales-Nelson managed the feat, certainly is more of a coincidence than a trend, considering there was a 33-year gap between the first two. The ability to bring both the pure speed and acceleration needed for the 100m, as well as the endurance required for the 400m is what makes the triple so tough. So it was almost comical to see how Nijjar was able to accomplish that particular double over such a short period of Tim on Friday. If she follows through on that mantra Saturday, Jasneet Nijjar will have joined some very rare company in the history of the B.C. high school track and field championships.